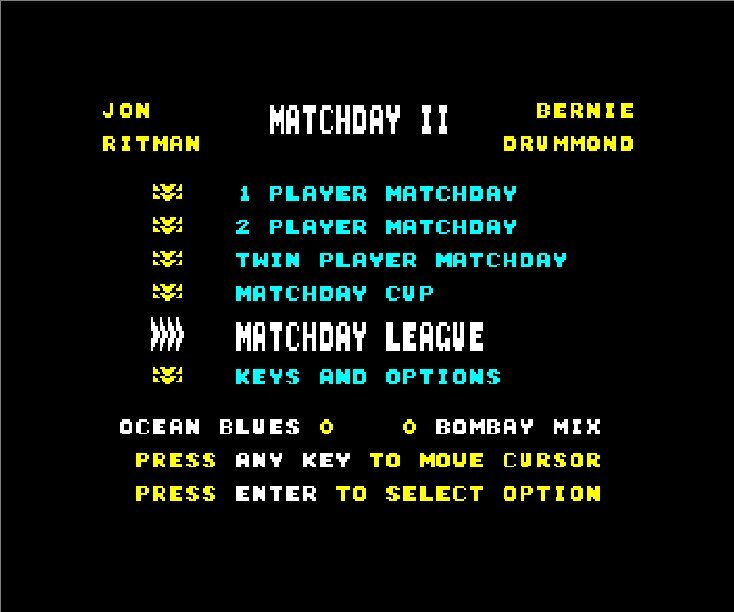 Matchday II is a stunning piece of programming by the legendary programming team of Jon Ritman and Bernie Drummond. It was the sequel to the original 'Match Day' that was released on the Spectrum in 1984. 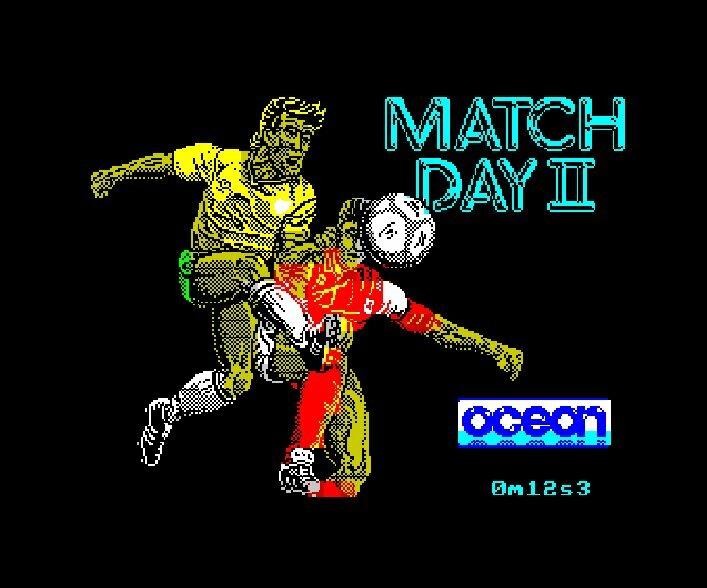 I must confess, I never really played the original Matchday much, however, what a superb game this 1987 sequel is. To the right is the ZX Spectrum loading screen. Note the unusual feature of a countdown clock, letting you know how long there was left until the game had loaded! I thought that was brilliant. I loved the loading picture too. When you load up the game, the first thing that was noticeable back in 1987, was the shear wealth of menu options available. Ritman and Drummond loaded the game with features and configurable settings. In fact, I can remember a lot of the game reviews of the time being bowled over by this aspect alone. The 'deflection' off the body was determined by the speed of the ball, it's angle and height and the direction and movement of the player. In practise, it meant that you could move the ball around and even score goals, simply by controlling the deflection of the ball off of your players' bodies. It really is amazing and it added significantly to the gameplay and realism. All of this great football game design was wrapped up nice with the ability to set up various leagues and cup competitions. Also, aside from being able to play single player against the computer, you could also play against a friend and even co-operatively against the computer! This was a revelation to me! Interestingly though (and frustratingly) if you played two player vs the computer, the Spectrum suffered from a hardware limitation which sometimes caused the players to 'freeze' onscreen. On the hardest setting, the computer is a very competent opponent indeed. You have to work very hard to eek out a good goalscoring opportunity. Once you play the game a lot, like anything, you learn how the computer moves and it is fairly easy to prevent the computer from scoring against you. However, you cannot rush and if you do make a mistake in defence, you will often be punished by the computer. Scoring a goal yourself is something that still occasionally challenges me. Sometimes you just have one of those games! Match Day II is a game that rewards patience. I have been playing Match Day II for the past three years now on an emulator and I still sometimes score goals of a type I have never done before - such is the potential variety the gameplay offers. With clever use of the kickometer (ground kicks and floated kicks), together with using the 'volley' feature, there is great mixture of styles you can use. It's a testament to the awesome design of the game. 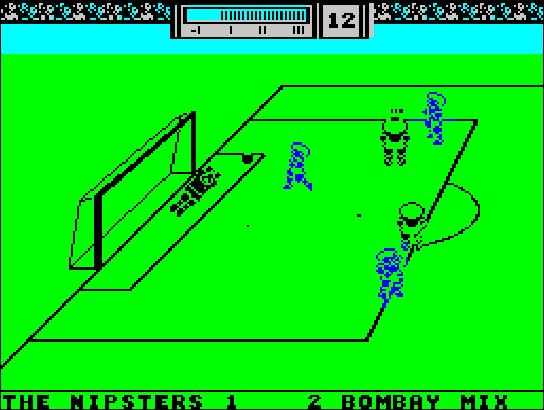 The classic one is that you can knock the computer player off the ball when he's taking a throw-in, leaving the ball hanging in mid-air before he goes to retrieve it. But these are minor things. Overall it has very few bugs (which is a fantastic achievement in a game like this I think). There are a couple of interesting little design choices in the game. The first is that when the ball goes out of play, the clock is stopped. So this becomes an in-game pause in a way. The second odd thing is that the team names displayed at the bottom of the screen, swap sides at half time! Initially I found this very confusing, but now I like it because it means you always know which goal you are defending (your team name is always positioned at side of the screen where your goalkeeper is). There are some lovely touches in the game. For example, you cannot score direct from a throw-in (isn't that brilliant?!) You can score proper goals in-off the post and bar and own goals are perfectly possible too. 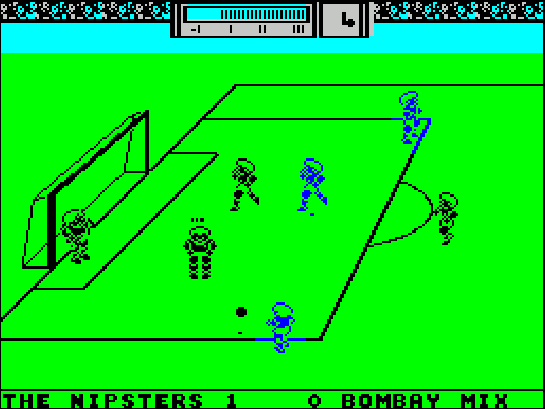 Also, if you just stand still with the ball, the computer will get the ball off you, or else you will be barged off the pitch, forcing a throw-in or corner. As you can see from the image on the left, six initial menus are presented to you. Each of these has sub menus which you can also delve into. 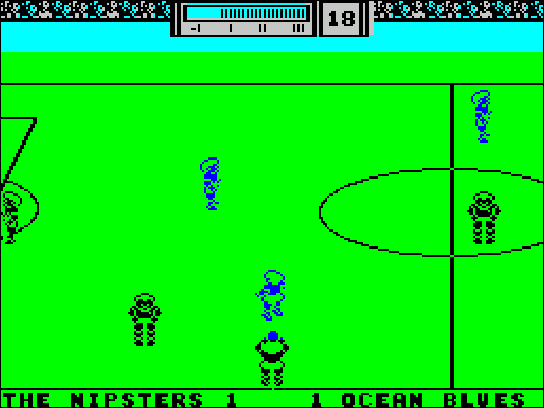 All the player keys can be reconfigured, as can the colour of the players and the pitch (I always used a green pitch!). You can also change the game length, the difficulty of the computer, the complexity of the kicking, the quality of the sound and much more. In Matchday II, you can play in cup competitions, leagues, or just one-off games. These are all selected from the menu. I used to always play in a league. 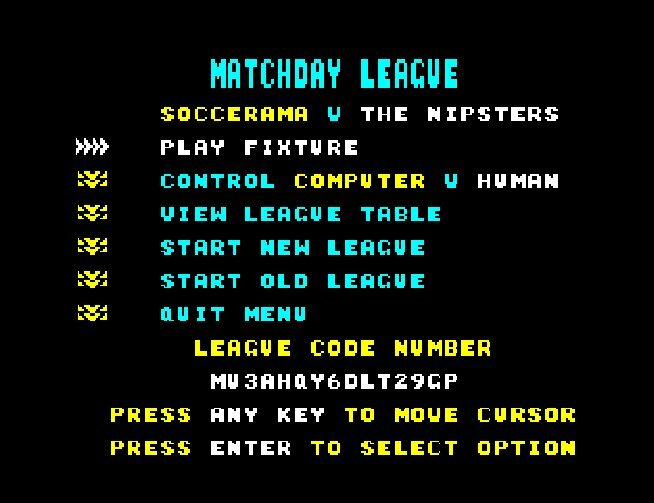 It is possible to enter your own team name (up to 12 characters) and this appears onscreen during the match alongside the score, which is permanently displayed whilst playing. The game incorporates what Drummond and Ritman called, the 'Diamond Deflection System'. This system meant that the ball could deflect off your players' bodies is multiple ways. This happened if a certain number of keys were pressed at the same time. What I thought was great though, was that in the instructions, Ritman et al mentioned this and had even analysed the key combinations that caused it. I always thought that was brilliant (rather than just shying away from it or ignoring it altogether). I used to play co-operatively with my friend Daniel all the time, for years. It was wonderfully satisfying to work together to create a goal scoring opportunity and to actually score a terrific team goal. Somewhat brilliantly, if you played in a cup or league, it was possible to 'save' the league and then come back another day and complete it! This was achieved through the use of onscreen 'codes'. (See image below). Every time you completed a match, the code would change. It was then just a case of writing down that code on a piece of paper. Whenever you wanted, you could then select 'Start Old League' from the menu and enter the code and bingo! - you were right back to where you were. How fantastic was that? My quibbles with the game are few. The sound is not that great (that was the Spectrum for you though) and the goalkeepers look a bit like American football players, but my main gripe really is the fact that there is no 'goal difference' recorded when playing in a league. This irks me as it would be the main discerning factor between playing multiple leagues. I'm going to give Ritman and Drummond the benefit of doubt here and say it was probably down to the memory usage and there not being enough space! 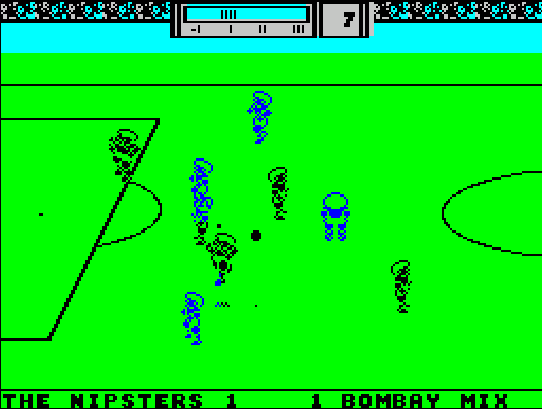 There are a few little quirks - for example, the computer always throws the ball directly off for a goal kick when taking a throw-in from the bottom left or bottom right side of the pitch. Sometimes, if the keeper touches the ball onto the bar, the ball ricochets madly and then flies wildly out up the pitch for a throw-in. I think it's always a great test in games to see what a game does if you just do nothing (ie, just let go of the keys and sit back and watch). 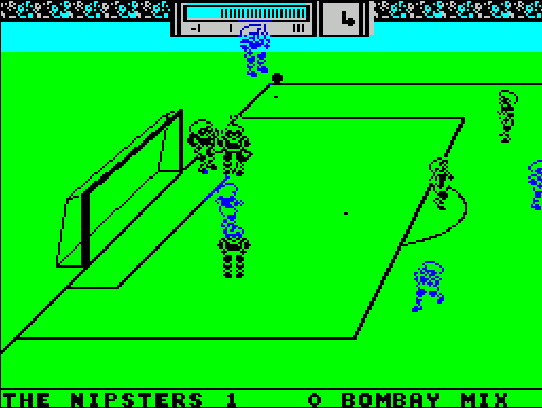 In Match Day II, the computer will invariably go for a goal and score. At the very least, there will be an attempt on goal. There is no offside rule in Matchday II (there are only six outfield players on each team) - but this is probably a blessing..
A lovely touch is that you can pause the game! You just hit the 'H' key and the game pauses and goes to a menu. This was brilliant (especially when mum called out that tea was ready!) 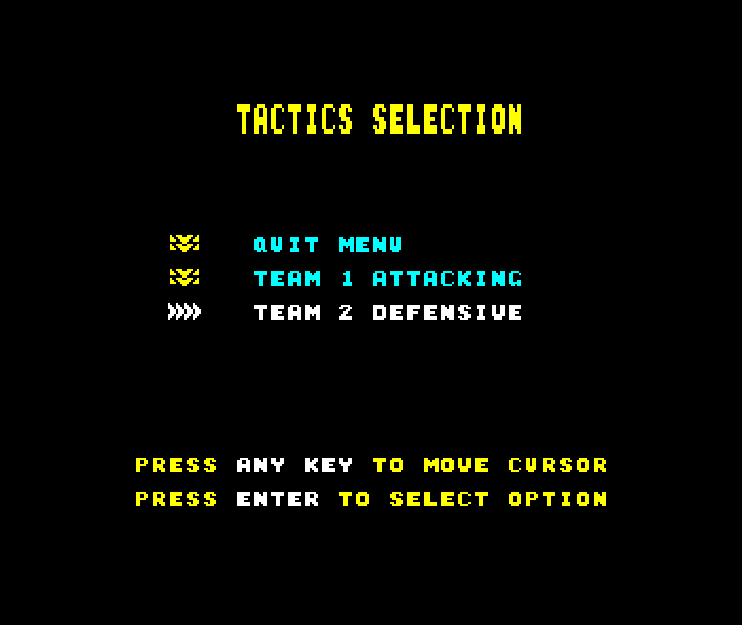 - and what's more, in this pause menu, you can change your tactics selection. - And this was 1987! (See images left. Click for full size). 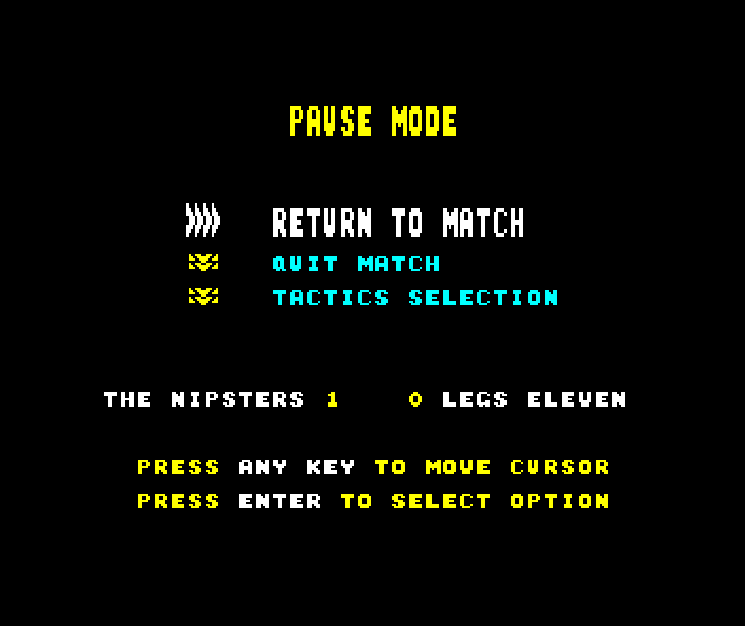 When you 'Return to Match' from the pause menu, what's also nice is that the game doesn't go instantly back into the action. It shows you where you are in the game - freeze frame. And it only continues again when you next press a key. I really like that as it means you can ready yourself on the keys before resuming. Above right, can see a corner being taken. There are a total of eight different configurations or ways in which you can take a corner, which I think is brilliant. It provides a lot of variety and scope for trying to create new types of goals. Headers are possible in many different ways. The height and power is determined by the player's movement and also where the ball strikes the head. You can head the ball without jumping or make the player jump to give the header more height. I have scored all sorts of different goals with a headed finish but probably the most satisfying way of scoring a goal is to volley. 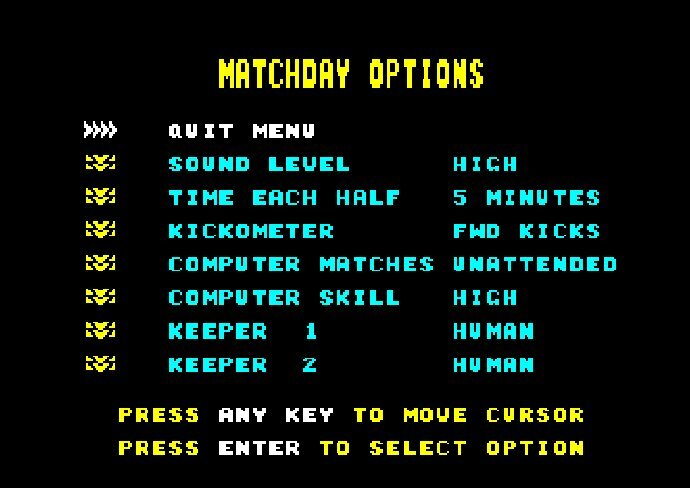 If you hold down the kick button in Match Day II, it 'locks' the kickometer at the power level you stop it at. Furthermore, when the ball touches one of your players, he will instantly volley the ball - low and hard. A throw-in to The Nipsters! 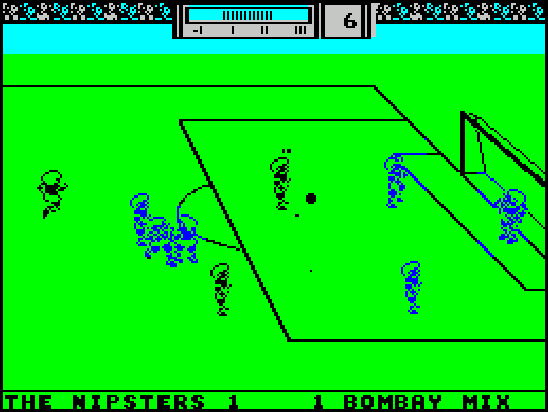 A Bombay Mix winger unleashes a volley shot towards goal! Because you have to hold down the kick button, it can be a bit tricky to do, but moving up the field in a continuous series of volleys and then rifling the ball into the corner of the net is very satisfying if you can pull it off! It's also the fastest way of moving up field, so if you are low on time left, volleying can often save you. You can see an example of a volley in the image above right. I hope you enjoyed my thoughts on this amazing game. If you have any thoughts on it yourself, do let me know!